LP O’Bryan, who describes himself as a crime & mystery writer and runs a blog when not writing professionally, has written a thought provoking article about the possibility of ‘something’ being under Hagia Sophia. His argument is that Crypts and underground structures were common in churches prior to the time of the construction of Hagia Sophia,so why is it that there are no underground structures? Perhaps there are some that we have yet to discover. Can modern technology help us?If there are some hidden underground structures under the Holy Wisdom, what might they contain? First published on Stranger than Fiction in 17 December 2010. When Ataturk turned Hagia Sophia into a museum in 1924, and gave the powers of the Sunni Caliphate to the Turkish parliament, it was like Mussolini turning the Vatican into a museum, and asking the pope to go away. Can you imagine the reaction these days if such a thing were contemplated for any other holy site? The Hagia Sophia that we see today is to a great extent, despite the rebuilding work carried out after regular earthquakes, the building that was consecrated on the 27th December 537 by the Roman Emperor Justinian. It would be the greatest church in Christendom for a thousand years, until St. Peter’s in Rome was completed. Hagia Sophia’s massive dome and gigantic proportions, visible in the image above, were believed by many to have been the work of the divine. It heavily influenced the architecture of mosques and churches and it’s grandeur was said to have led Russia to convert to Orthodox Christianity, not Catholicism. Relics such as the shroud of Mary, nails from the true cross and the tombstone of Jesus were some of its treasures, until the city was ransacked during the Fourth crusade. Much of the above is well known. What I would like to focus on is the lack of any crypt, cellar, or underground areas in the building. My question is, why are these features missing in Hagia Sophia? Crypts were well known architectural features at the time the building was designed. Both the Church of the Holy Sepulchre in Jerusalem, constructed in 326-330, and Old St. Peter’s in Rome, constructed at the same time, both at the time the original Hagia Sophia was constructed, have extensive underground areas. The questions is, why would Isidore of Miletus and mathematician Anthemius of Tralles, architects of Hagia Sophia, have left such an important feature as underground chambers out of the design of Hagia Sophia? In Rome the catacombs, passages and tunnels under old St. Peter’s were the result of the building being placed over a cemetery and near a temple to an Etruscan god. In Jerusalem the Church of the Holy Sepulchre was placed over a temple to Aphrodite, the goddess whose priestesses engaged in ritual prostitution. That site was found to cross over the tomb of Jesus by Helena, the mother of the Roman Emperor Constantine. The underground section of the site is now its main attraction. Sure, the tomb of the Doge of Venice is located inside Hagia Sophia, but that wasn’t constructed until 1205, and it’s not an impressive structure. 1. Crypts were well known features of early Christian churches from before the construction of Hagia Sophia. They were used in the early Christian period in North Africa at Orleansville and Djemila in Algeria, and at Saint John Studio in Constantinople itself. 2. Where Christian churches were built over late Roman era temples, which included underground areas, such as a mithraeum, these were adapted to serve as a crypt. Hagia Sophia was built on the top of the hill around which the then old Greek city preceding Constantinople had originally been founded. There is every reason to believe that a Roman era temple would have preexisted the earliest Christian Hagia Sophia, perhaps dedicated to Isis, as the nearby Hagia Eirene was built over a temple dedicated to Aphrodite or possibly to the Greek Goddess Eirene. 3. The two other main patriarchal cathedrals of the Christian world at that time, Jerusalem and Rome, both featured important underground areas, the tombs of Jesus and St Peter respectively, as discussed above. Now it certainly could be true that Hagia Sophia is the exception here, but I think we should consider why the entrance to any underground area would have been concealed. What could be the motivation for concealing any tomb, tunnel or crypt under Hagia Sophia? When Constantinople fell to the Ottoman armies in 1453 it would have been clear to the guardians of Hagia Sophia that the church would be desecrated and turned into a mosque if the city fell, as appeared likely to many. They had motivation and plenty of time to properly conceal any entrances that existed. To me the possible takeover of the city provides clear motivation to seal up any underground chambers under Hagia Sophia. The existence of sacred relics and the principles of Byzantine secrecy only add to such motivation. Legends speak about such places under Hagia Sophia, one talks about the devil being imprisoned there, but that isn’t proof that any such place exists. Nor do my arguments above. The only thing that will prove the existence or non existence of such features is a proper geophysical survey using ground penetrating radar and the latest magnetometer equipment. Until such a project takes place we can only speculate about what might be under there. This entry was posted in History, Istanbul, Uncategorized and tagged Byzantine, Byzantium, Hagia Sophia, Istanbul. Bookmark the permalink. 5 Responses to What secrets are hidden under Hagia Sophia? I was there last year and thought precisely the same as you have described. There must be crypts, tombs, etc. under Hagia Sophia. Are there any references to such in the literature of the time? In one chapter of the very interesting book written by Ersin Kalkan ” The world beneath Istanbul” there is a chapted dedicated to the world below Haghia Sophia. In particular he describe the experience of Goksel Gulensoy who, with two divers and four cave experts, reached places no one has ever enter before. Hagia Sophia is not a symbol of Istanbul, the Holy Wisdom has been desecrated by the Turk. At best, one may say, the Minarets are a symbol of Istanbul; nothing more. Hagia Sophia was consecrated as a Christian Basilica, not as a mosque. The Turks hold her captive as a trophy, they have built Sultanahmet Mosque in her likeness, they defile her with minarets, the minbar and the mihrab and cover her ornate mosaics and iconography. 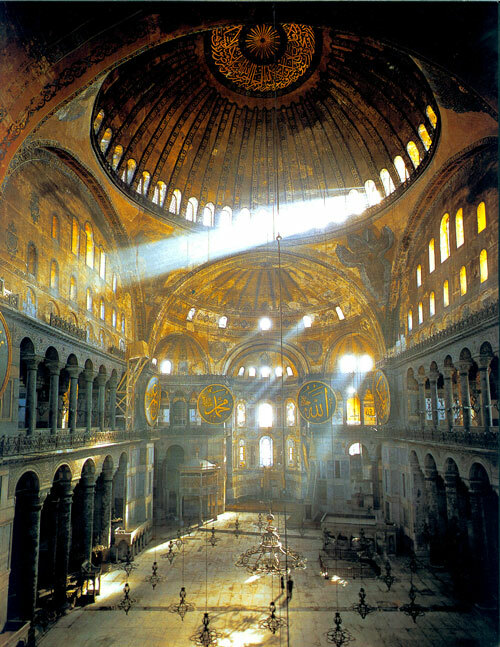 Hagia Sophia is and always will be an everlasting symbol of Orthodox Christianity. The day will, indeed must, come when she, with the Queen-city of Constantinople, is restored to her rightful inheritors, the Hellenes, the descendants of the Byzantine Empire. The name Hagia Sophia is Greek, indeed the name Istanbul itself is a Turkish corruption of the Greek expression, “eis’stin poli,” that is, “(you’re) in the city,” which is what the Greeks – to whom the city belongs – would tell Turkish visitors passing by.